Built as part of the Meadowlands Sports Complex in 1975, Giants Stadium was built to serve as a home for the New York Giants, who moved from Shea Stadium beginning with the 1976 NFL season. In 1983 the New Jersey Generals were born, but to readily admit that the Generals were playing in the home stadium of another team - and an NFL team at that - would be sacrilege. To avoid this situation, the Gens and the USFL's television partners agreed to refer to the facility as simply "The Meadowlands," a practice adopted by the New York Jets when they joined the Giants as tenants at the stadium in 1984. Sometimes the USFL's printed materials would slip and use "Giants Stadium," to the dismay of team owners J. Walter Duncan and Donald Trump. 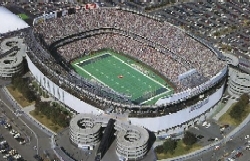 The seating capacity of "The Meadowlands" was 76,891 back during its USFL days. Giants Stadium closed in early 2010 following the completion of a new stadium next door. It was demolished that same year.